Public passion for shark finning bans is great. How do we channel it towards other issues? A recent proposal in New Zealand to outlaw shark finning received more than 45,000 public comments from all over the world, a staggering amount of public interest in fisheries policy. This is great news, because though many activists don’t really know what it means, shark finning is a major threat. Shark finning may well be the most brutal and wasteful method of gathering food in the history of human civilization, and New Zealand was one of the few developed nations that still legally allowed any form of the practice. Though there are still some significant issues with New Zealand’s proposal, it was still very exciting to see so much public passion for an issue that few cared about, or even knew about, when I was growing up. However, a finning ban is merely a first step, for the most part only controlling how sharks are killed, not how many are killed. A recent study showed that finning bans alone were insufficient to ensure sustainable fisheries. In many nations (including the United States), the interested public has a role to play in implementing all or most of the next steps a comprehensive sustainable fisheries policy for sharks and other fishes. Unfortunately, we haven’t seen anywhere near the same level of public engagement in other shark conservation issues as we see for big, flashy issues like bans on finning. For example, dusky sharks are considered heavily overfished in the United States, with one estimate for time to rebuild the stock exceeding 400 years (yes, the U.S. government currently has conservation plans whose time scale exceeds how long there has been a U.S. government). A recent proposal by the National Marine Fisheries Service that would have altered the minimum size of sharks that recreational fishermen can catch with the goal of reducing illegal dusky shark landings and added a new area closed to shark fishing received almost no public support from conservation activists. There were a total of 122 public comments submitted, and most were strongly opposed; the commercial and recreational fishing industry was organized and vocal in their opposition to this plan. The NMFS withdrew it. As low as it was (122 comments is much lower than 45,000) , the dusky shark proposal actually demonstrated a relatively high amount of public interest compared to other important shark and ray conservation issues involving dogfish, sawfish, and thorny skates, not to mention broader issues like bycatch or habitat destruction. It can be hard to get the public to be interested and passionate in less flashy, but no less important issues. This is unfortunate because many of the most critical steps in a shark conservation and management plan can’t fit on a bumper sticker. Please leave your suggestions below as comments! U.S. government: shark fin bans "significantly undermine conservation and management of Federal shark fisheries"
1) The population is very low, which makes people feel like their voice is actually heard in the debate. Politicians pay attention. The news is full of nothing-very-much most days, so huge controversy develops over really minor issues just to fill the newspaper. (My favourite multi-day front page item: average level HS rugby player can’t find cleats big enough for his really big feet. Update: He found some.) Socially conscious people in the US can only post so many socially conscious facebook posts per day without getting unfriended, and they have thousands of issues to choose from. Socially conscious people in NZ usually only have one or two issues at a time (at least if they focus on internal NZ fights). 2) This is an issue in which the downsides are only felt by a very small subgroup of people who most people don’t have great sympathy for. A few commercial fishermen and what they see as a bunch of rich foreigners who like shark-fin soup. So its politically easy to get policy changes passed. If the fight was over protecting shark species in general, some people are more concerned about their safety when swimming, so politicians wouldn’t want to be seen as radicals who value a shark’s life over a swimmer’s. Shark Week is actually a hindrance rather than a help here, since the bogans all watch endless footage of dramatic shark attacks and really don’t get the science. We have plenty of Great Whites here, and a guy was killed at my usual beach earlier this year. We are very conscious of overfishing (categorically) because recreational fishermen can see a dramatic change in fish populations even over a generation here, but people don’t necessarily see sharks as more important than any other fish, and unlike other fish, they are also potentially dangerous. 3) Kiwis have exceptionally high environmental literacy, as it affects their country and their day-to-day life. Our primary appeal is being seen as a beautiful destination. Why else would you want to live in a really expensive country that is totally isolated from the rest of the world? The sad truth is that we aren’t terribly green (environmentally speaking); we just have really low population density and naturally stunning landscapes. BUT people think these natural treasures are worth preserving. They also really value preserving the NZ way of life, which involves a lot of outdoor activities, particularly water-based, so anything that jeopardizes that is worth paying attention to. Here is a list of some current environmental issues that have gotten way more (local) grassroots support than shark finning: offshore drilling, catch limits for recreational snapper fishermen, stop the spread of Didymo, for/against drops of 1080 poison to control invasive rodent populations. 4) I know this shark finning issue got a lot of international coverage, but does anyone have studies that show that international opinion (as posted on facebook / useless petitions) has an effect on policy in any particular country, when local opinion is controlled for? I guess what I am saying is that it is possible that different methods will likely have different levels of effectiveness by country, depending on the biases and behaviors of typical people within the country of interest. As for what can help create a good shark conservation plan, in either NZ or the US? Eek, solutions are hard! To clarify, I am not asking people to come up with policy solutions. We have policy solutions. I am asking for help getting people to know about and care about those policy solutions as much as they care about shark finning. Perhaps the Public is more knowledgeable than you give it credit for? I was one of those 122 who commented in opposition to the NOAA fisheries proposal to increase the recreational minimum size to 8 feet. It seemed to me to be a totally irresponsible response to a non-problem. No recreational fisherman wants to harvest an inedible dusky shark, and to do so is already illegal. Illegal dusky shark landing are, in all likelihood, miniscule. But the proposed new rule would have prevented recreational fishermen from landing many of the mako and thresher sharks that they so highly prize. Perhaps the “public passion” is well tempered by more than a little good sense? Mike, the best available scientific evidence suggests that dusky sharks are in serious trouble, and that stronger protections are needed. To call this a “non-problem” is simply incorrect. Whether it is appropriate to restrict fishing of some species in order to protect another species that is indirectly harmed by that fishing (something that we do all the time) is a political question, but my point was a remarkable lack of public interest in the issue in the first place. No doubt the Dusky shark is in trouble. My point is that the proposal would have done nothing to remedy the situation, while having ill effects in other areas and that, perhaps, the public was educated enough to see that. To be honest I actually lean towards Mike on this issue. The goal of good fisheries management is to sustain a species while keeping the fishery open. An 8-foot size limit on all sharks would have effectively shut down the recreational shark fishery (though a strictly catch-and-release option might still have been possible). Regarding dusky sharks, the biggest issue there is misidentification, especially among recreational fishermen who aren’t necessarily on the water or interacting with sharks as often as researchers, charter, or commercial fishermen. We probably all know of someone with an extremely nice boat that they only take out maybe 2-3 times a year, usually to try and catch something big. That’s who that policy was aimed at. It’s all about trying to identify the main issues and focusing on those. Are those people putting a big enough dent in the dusky shark population to justify such an extreme size limit increase? Would requiring rec fishermen to take a shark ID class or carry an ID sheet on the boat with them be more helpful? Or should that effort be directed elsewhere, like time/area closures on the commercial side? This is why we do the research. There is an inherent difficulty in getting mass public engagement in complex environmental issues as most casual observers are informed by the media. Not many people know, or probably need to understand, complex policies, scientific theories or decision-making processes to care about issues. The reason that shark-finning, culls or sanctuaries get popular support/condemnation, is because they are easily relatable. Personally, I believe what is more important than mass support of a multitude of issues, is that organisations such as NGOs involved on behalf of civil society, ensure that wider public opinion is captured and illustrated to the decision-makers. It can be readily assumed that the majority of the 45,000 supporters of an anti-finning policy would also support other less newsworthy issues, such as National Plans of Action, or CITES implementation of shark species, so this can be taken into account when seeking indirectly linked conservation strategies. Here’s a recent example from the UK & Europe. Last year, the European policies governing fisheries were up for their once in a decade reform. This is a policy that governs fishing of all vessels from all 27 European countries. There were a number of severe flaws in the existing policy (and its related fisheries subsidy policy) that promoted overfishing & unsustainability. Hugh Fearnley-Whittingstall, a high-profile celebrity chef with a terrestrial television programme in the UK, looked at one very specific issue, discarding of perfectly edible over quota fish, and ignored the rest of the issues, most of which had a much more detrimental effect on the stocks. He focussed on this one issue, made it a relatable story (perfectly good fish being wasted) and stuck to it. He managed to gain nearly a million signatures asking to end the one specific issue of discarding. As the policy was debated over the course of 18 months, the public opinion on that one issue was used to highlight public support for sustainability, and in the end, the policy was very successfully reformed, and included clauses relating to fishing within MSY, adhering to scientific advice and issuing of fish quotas based on environmental criteria. Also, a landing obligation of all fish was placed on boats which would end the practice of discarding. Subsequently, the sister policy of how fisheries subsidies were spent was also successfully reformed, with more public money going towards research and sustainable fishing practices. A lot of the political leverage was down to the public support of one related issue. Speaking with politicians & decision-makers, I have been told on numerous occasions that they will often listen to one carefully worded letter from an individual than mass petitions, although these do have their place in making sure decision-makers know the general consensus. 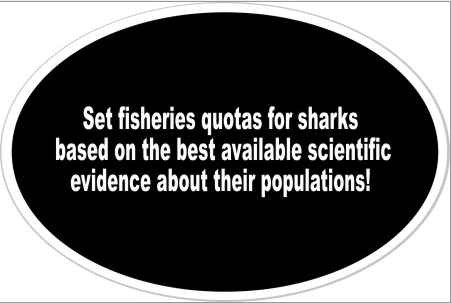 In my opinion, for real changes to shark conservation policy, well researched scientific evidence is more valuable in some of the more “boring” issues than public opinion, but that public opinion needs to be engaged when best available science is ignored. Good topic, by the way. So, David, why are we not looking at the community action model? Put together a base of supporters for particular issues who each has a wider base of followers/friends that they can motivate on those issues. Then, instead of running into a post by chance (as I sometimes do) those spindles in the wheel could be enlightened/informed/enlisted to motivate his/her group of followers/friends. An email from one to the “group” would ideally set in motion an information wave which would hopefully be large enough to make a difference or at least be noticed and taken seriously. I know I have a sort of petition-fatigue at times. This might help us bypass that syndrome and do some better work. Thanks for raising an interesting question and prompting the debate. You’re into the territory of marine citizenship – a society who recognise the benefits of a healthy sea and see themselves as agents of change to positively or negatively influence that health. –	Seeing the public as more than one audience. It’s easy to see public as one homogenous audience, and as a consequence, search for one way to engage them. Think of your family and friends, they all go on different holidays, read different books, do different jobs etc. – different values motivate them. It’s the same with catalysing conservation interest – people will be passionate about different species/issues/places depending on their values/age/gender/education/knowledge etc etc. –	It’s not just about information and awareness raising. The knowledge deficit approach is to assume that people do something with negative consequences because they don’t know about the negative consequences and similarly that we can just promote issues and people will engage. Governments spend lots of money filling these knowledge gaps in the hope that we will all stop smoking, drink less and eat more fruit and veg. However, lots of people keep smoking, drinking and don’t get their five a day. Check our Kollmuss and Agyeman’s paper on the knowledge action gap (2002). We need to take into account this sort of social science research when answering marine conservation questions. What this all really means is that we sometimes need to step away from our usual view of conservation issues and see the world from the perspective of the audiences. This is difficult, but studies of public perceptions and other social science tools help us to do this. Also, we must also work to engage audiences rather than just educate them through conversation rather than telling them the ‘right’ answer. I’d be interested to discuss this further with you. My student has a paper on public perceptions of sharks currently in review, I’ll send a copy when it’s available. That’s the same route that generated those 122 comments on the revised shark regs when they were proposed. Also, I would like to note on Atlantic Highly Migratory Species Bluefin Tuna Management, Amendment 7 we reached out to the fishing websites. Keep America Fishing sent out a mass email to their 20k members. Most of the public comments have come from anglers with a conservation mindset. This is how public comments should go. We all need to work together to get these new regulations enacted: scientists, activists, and anglers. This is a topic that has wracked my mind. Not just how to tackle finning but many other issues too. First off the terminology used in the regulations is all legal and scientific and not easy on the eyes of the public. There should be an easier to understand explanation on the amendments and regulations to help engage and educate the public. I feel that is where conservationists and scientist can come in and help break down the mumbo gumbo and help educate the public on what they are reading and break it down into “Sharks for Dummies” terms. I truly believe if people understood what was going on they would join in vs just shutting it down as soon as they look at it due to lack of knowledge. The terminology scares people off immediately! Than we have the issue of in house fighting between groups, scientists, activists, conservationist, anglers etc. Sometimes a scientists or conservation org will refuse to share the information due to a difference of opinion between the parties no matter how IMPORTANT the issue might be.I am now going to speak for myself. I passed the Amendment 7 for Bluefin Tuna around, it has huge importance for our area of the NWA. I didn’t pick and choose who to make aware of it by how I personally felt about them or their Org. Believe it or not Sarah and I received more of a warm welcome from anglers than we did conservationist or scientist! The same people I might take to task about landing immature makos in our area or not practicing CPR. They didn’t shut down our request for help because we held a different view…In the end conservationist, activists, scientist, and anglers need to join forces when it comes to the health of our oceans and grow up and put their personal views aside for the better in a whole. I have to ask David, did you submit a comment on or share the Amendment 7 link I sent you? If not, may I ask why? I sent it to you in the hopes you would share due to the fact you have a huge base of followers that respect your opinion. I also sent it to you out of the respect I have for you and your work. My general suspicion is that emotive topics almost always result in more public outcry, which is why more people (especially those who aren’t involved in science or the fishing industry) care about shark finning than fishing regulations. I feel like many successful PR programs for conservation issues do so by making the issue more emotional. Am I mistaken? The dusky shark fishing regulations are important from an ecological perspective, but issues that are only framed in a scientific manner don’t seem to get the same amount of public support as issues that make people feel outraged. If it is largely a matter of semantics, the only thing you can do is frame the issue differently. Although making people develop an emotional affinity for sharks (or at least reducing their apathy towards the issues), while still being scientifically rigorous and informative, is a whole ‘nother can of worms. Is it, then, mostly a matter of the right NGO (or blog or article or whatever) getting the word out about an issue in a way that people can identify with, while also having good scientific content? It seems very hard to balance those two things, as having too much scientific content seems to reduce people’s ability to identify with the problem, but having too little means people may not be well-informed, even if they care about the issue.